They don’t tell you this in Disney movies. They don’t show the Prince navigating his midlife crisis with a sports car and a sudden affinity for the gym. They don’t show the Princess crying herself to sleep wondering if she’s lost the best years of her life to someone who barely seems to acknowledge her. We don’t discuss the in between from lust and butterflies to real love. That sticky, awful mess of a place where you genuinely wonder if you were high when you picked your partner. It’s almost like you have to be picked apart, stripped right down before you can start to really love someone. It’s where you stare it right in the eyes, the idea that you can hate someone as much as you love them. 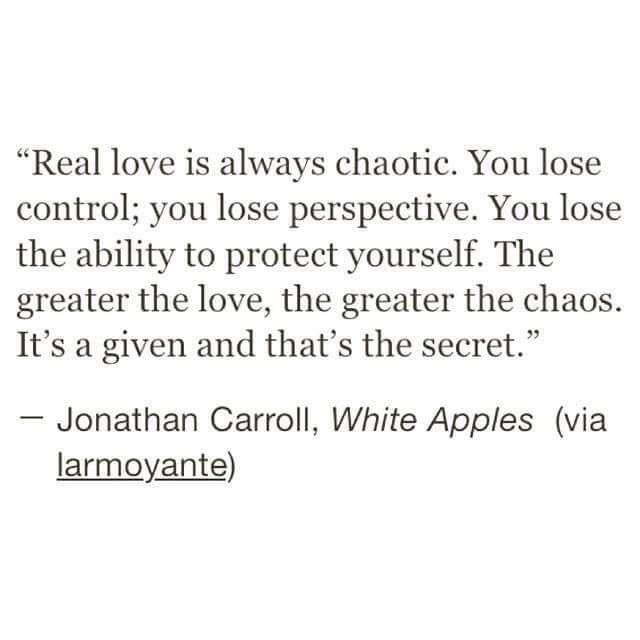 And when you get there… right there, that’s when it’s real. You embrace the ridiculous vulnerability and recklessness of navigating the human inclination to be selfish and fickle. We’re such assholes to each other. The longest relationships I have witnessed will tell you that first and then admit their deep and abiding love. I can only tell you, that I’ve never loved anyone who didn’t make me feel like I was losing my mind.